President Obama issued an executive order on Dec. 5, calling for an increase in solar, wind, and other renewable energy for federal agencies, to 20 percent by 2020. That's three times the amount that the agencies are currently using. The usage is expected to go up by 10 percent by 2015, at least 15 percent between 2016 and 2017, and 17.5 percent between 2018 and 2019. Obama declared, "In order to create a clean energy economy that will increase our nation's prosperity, promote energy security, combat climate change, protect the interests of taxpayers, and safeguard the health of our environment, the federal government must lead by example." The Solar Energy Industries Association (SEIA) commended the president for his bold step forward on this matter. SEIA president Rhone Resch remarked, "From an environmental perspective, few things threaten our nation's future prosperity and way of life more than climate change. That's why it's so important for the federal government to lead by example. We applaud President Obama for standing firm and following through on a key commitment he made as part of his Climate Action Plan. "Moving forward, we also encourage the administration to develop a modern procurement process that allows solar to compete evenly with fossil fuels. Federal agencies should have the authority to adopt long-term power purchase agreements in order to maximize savings for U.S. taxpayers." The solar movement is indeed catching on in the U.S., with New Jersey, California, and Arizona being the top states to implement the technology. Conversely, there are more solar companies in the state of New Jersey than tanning salons. Arizona, meanwhile, installed more "utility-scale solar" technology than any other state in 2012, according to SEIA. And Maryland and Massachusetts saw sharp declines in the cost of solar installation during 2011 and 2012. Given these developments, it would seem logical that federal agencies should follow suit. The push to move the Obama administration on to a clean energy path began, at least partially, last year, when the Pentagon committed to establishing three gigawatts of renewable energy on Army, Navy, and Air Force installations by 2025. That's enough to power 750,000 homes. The president's executive order, however, gives the overall clean energy push some much needed thrust. The photo shows President Obama speaking to the Airman of Nellis Air Force Base Nev. during a visit to Las Vegas. 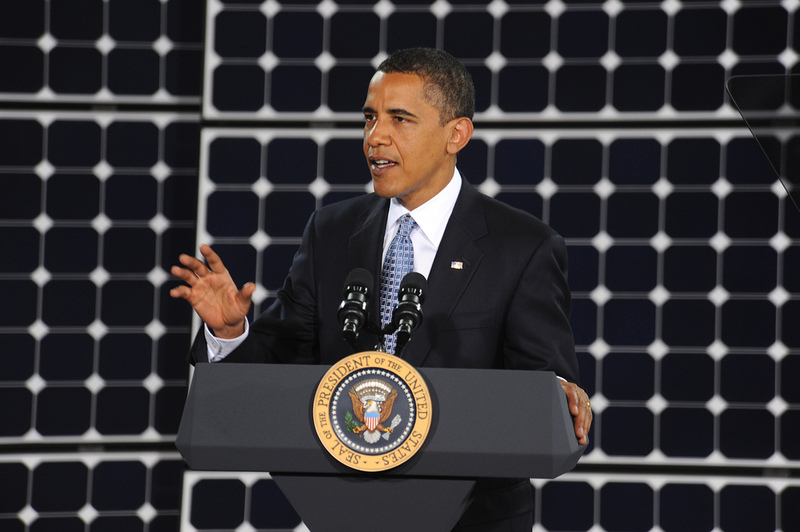 The president spoke about issues concerning world energy and the importance of solar power. Photo Credit: Nellis Air Force Base (cc).